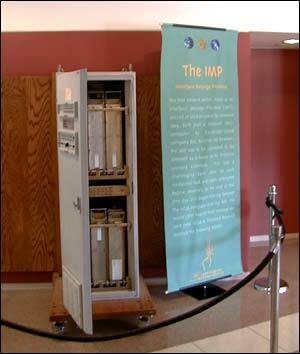 Thirty years ago today, the first communication between the Interface Message Processor (IMP) and a host computer took place in a Computer Science Lab at UCLA. The ARPAnet was born, with four nodes by the end of 1969. Today amid the current explosion of Internet growth, the pioneers gathered along with the forerunners of the internet revolution to commemorate that first event and talk about where we are today and where we go from here. 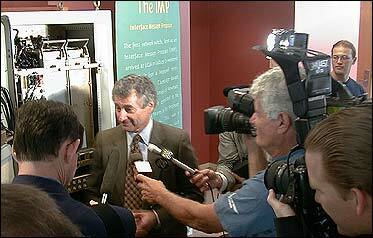 As I walked in, I caught Leonard Kleinrock in the lobby being mobbed by reporters doing interviews in front of the original IMP. As you can see in the photo, several local news and radio outlets covered the event. I had hoped to see some of the footage on the 11 o'clock news, but as I write this, it's just after 11:30, and I only saw a few seconds and quick mention on one of the network news shows. After 20 minutes of mulling around past the original start time, The Chancellor started off the event with a quick welcome and general speech about how the internet has spread and enriched our lives. The Chair of the Engineering School at UCLA spoke next for about 15 minutes, discussing the impact of Leonard Kleinrock's achievements and Len's great rapport with his former students. Len Kleinrock took the stage and recounted the 20th Anniversary event, which was a symposium held at UCLA, the 25th Anniversary event, which was held in Cambridge, Massachusetts, and a recent gathering just a few days ago up in Stanford. Those events, he said, focused on the rich history of how the ARPAnet was built and how it eventually lead up what we call The Internet today. Rather than delve into the past, he went on, today's event was going to center around where the Internet will lead us into the future. I was a bit surprised at first, but relieved that I wasn't going to see a rehash of the history, but a refreshing dialogue between the brilliant set of panelists of what they felt was to come. Dr. Kleinrock then laid down the ground rules for the day. 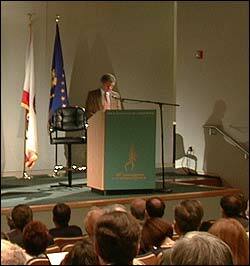 There would be four panels, and he would act as chair of the event, introducing each moderator. He introduced the first panel, titled "Gorillas", which was supposed to represent the proverbial 900 lb. gorillas of the Internet industry. Joining the moderator, Kipling Hagopian of Brentwood Venture Capital were Christine Hemrick of Cisco, Daniel Rosen of Microsoft, George Vradenburg of AOL, and Ronald Whittier of Intel. Everyone on the panel was in good spirits and took some gentle jabs from the moderator. When the moderator made a joke about the justice department's crackdown on Microsoft, the representatives of Microsoft and AOL both praised the low regulation of the industry thus far and accredited their rapid and extreme growth with the "hands off" policy of the U.S. government. They also stated their support for ICANN and the deregulation of the Internet's domain namespace. In response to a question about the growth of Cisco, Christine Hemrick praised openness and non-ownership of industry standards like TCP/IP. Since no one owned TCP/IP, she said, anyone could start a company that based their communications on that protocol. The moderator asked several questions about bringing broadband into the home, and whether cable or DSL would be the key technology. Ms. Hemrick stressed that wireless technologies might surpass the capabilities and availability of cable and DSL very soon, which was a good thing to hear. The panelists were a sharp group of people, whenever a question about upcoming technology was posed, they acknowledged the fact that the industry moves so fast that no one knows what we will be using in 5 years for any specific technology. They pointed to the audience several times and said that someone among us could start a new company tomorrow with technology that could blow away anything their corporations had done before. When the panel was asked about the longevity of their large corporations, they agreed that scalability was important, to grow with the industry, but trying to stay as close as possible to customers and continuing to address their needs was also important. All the panelists talked about how hard it was to stay ahead of everyone, to continue as industry leaders with so many competitors on their heels. When asked about the future, one panelist commented that soon the term "e-commerce" would be meaningless, due to a blurring between conventional commerce and commerce done over the Internet. Someday soon, they said, every business would have some aspect of it that would be Internet related. All in all, the four panelists were charismatic, well-spoken, and a hip bunch, making a few jokes about Al Gore inventing the Internet. The second panel was for the people behind recent industry successes, titled "Netpreneurs." It was moderated by Willem Mesdag of Goldman Sachs and the panelists were David Bohnett, founder of GeoCities, Eric Brewer, co-founder of Inktomi, Sky Dayton, founder of EarthLink, John Payne, CEO of Stamps.com, and Henry Sameueli, co-founder of Broadcom. It was amazing that no company represented on the panel was created before 1991, with most of them formed in either 1995 or 1996, yet they all had market caps of at least a billion dollars each. Overall, the second panel wasn't as interesting as the first bunch of panelists, some of their answers sounded like a press release. This was especially true for Sky Dayton, who sounded like he was repeating his radio commercials in response to every question he was asked. When asked how they became successful, each panelist talked about how their company filled a void not covered by a larger company, and how they could move faster than a large corporation. Sky Dayton stressed this, the size of your company compared to your competitors was unimportant. What mattered most was the speed at which you could respond to changes in the industry, economy, and customer base. He said that if you were starting a new company, focus on one specific area of the market, and stick to it. Don't try to be monolithic agencies that can do everything like Microsoft tries to be, he said, just do one thing really well and you can emerge as a market leader. He also pitched his new company eCompanies.com for budding entrepreneurs, they are setting up a clearinghouse of new ideas, and intend to fund business plans that catch their eye. When asked about the potential for new companies Dayton said something interesting, he estimated that the development of the Internet as a "thing" was about 20% done at most. That even in 1999, we were just barely scratching the surface of what is possible, he said. Overall the session was enlightening and I came away with a new found enthusiasm to get my ideas out the door. The third panel was perhaps the most interesting. It was titled "eConsumers" and was moderated by Patt Morrison of the LA Times, who was joined by John Barlow, co-founder of the Electronic Frontier Foundation, Jeffrey Cole, director of UCLA's Center for Communication Policy, Alan Kay, VP of Imagineering at Disney, and Dan Lynch, founder of Cybercash. Although the panel was supposed to focus only on consumer issues, the topics discussed ran the gamut, from personal privacy issues to numerous "what if" scenarios of our future ultra-wired world, and the social implications of each. Patt Morrison moderated as a sort of devil's advocate, asking for the panel's reaction to several cynical questions like trusting e-commerce vendors, internet rumors becoming news, and how our lives may be hindered by the burden of technology. Surprisingly, the panel, which had varied opinions on most topics, all found something positive in each question and future scenario. An ebay deal gone bad meant a user could learn to be more careful of sellers, news could not be trusted and should be approached with skepticism, and our lives could be made much better by an increased use of technology by saving us time spent on mundane tasks like paying bills or waiting in lines while shopping. Intellectual property and copyright issues were discussed, where John Barlow and Alan Kay agreed that intellectual property was dead, and that ideas should be given away freely. Mr. Barlow talked about how every article he's written is freely available online, which allows him to generate revenue from unwritten works. Publishers can see all his writing, he went on, and they pay for new pieces to be written. He said he didn't worry about copyright, because he most valuable ideas were the ones he hasn't had yet. John said it was the philosophy behind the Grateful Dead (whom he wrote songs for); they allowed their shows to be freely taped and exchanged, and they derived revenue from people wanting to see them perform live. Alan and John also talked about how a lot of intellectual property is meaningless to much of the population, that a technical idea is so complex that few people understand it, regardless of whether or not it is in the public domain. Dr. Kay used Linux as an example of this, the kernel is so complex that one in a million people can understand it all and contribute programming expertise. But with the advent of the Internet, he added, finding that one in a million is easy, and 100 or more people can be brought together to work on it. He praised the development of the ARPAnet because it was open, allowing researchers from all over to contribute to a greater good, and said in today's climate a large corporation would probably try to make much of it proprietary and hinder its development. When asked how Linux can generate revenue, Alan said that like the Grateful Dead example, giving away Linux meant that large fees could be found in consulting, helping companies use the technology to their advantage. He then mentioned something that dropped just about everyone's jaw: he said that the company with the biggest revenue in the computer industry was not Microsoft, but IBM's consulting business, which he said brings in double the revenue that Microsoft does selling software, just by showing companies how to use technology in their business (which Linux is a part of). Alan Kay stood out as an extremely articulate guy with numerous enlightened answers, and everyone on the panel had great things to say about what the future might be like. Along with the theme of the day's event, the forefathers of today's Internet focused solely on the future. Since they all have networking backgrounds, the first question was whether or not the network could keep up with client demands. The four panelists unanimously agreed that the capacity of the network would continue to expand at a rate greater than our immediate needs. They acknowledged the limits of the current IP naming system, and that IPv6 would expand the limit of addresses to near 10^38. Len Kleinrock had a problem with these imposed limits and Vint Cerf joked that 10^38 IP addresses would mean enough for "a web page for every molecule on earth." Len clarified his protest and stated that we should instead design variable length solutions to the problem, solutions that offer unlimited means. When asked about limits of physical devices like routers handling packet switching, they agreed that packet switching would probably be replaced by an unknown technology, and that physical capacities of networks would increase with the increased use of fiber. Len said instead of digital packets traveling through copper wire, in the future, it would just be pulses of light traveling along fiber. They all spoke of the proposed growth of the Internet, to surpass one billion people online in the next decade, and they mentioned something that was discussed briefly on an earlier panel; that someday soon, anything you buy over a certain price, say $25, would offer connectivity to the internet for a specific reason. Not a toaster that checks email, but each appliance would use the Internet for communication purposes. This was another reason Len used to support unlimited IP addressing, due to the fact that billions of devices would need to access the internet. Questions asked by the moderator were mostly big picture, and the panel discussed them at that level. They talked about distant futures, when billions of people would be interacting with billions of devices, we would see drastic changes in Human-Computer interaction. They even alluded to the similarities between an enormous interconnected network of people and machines approaching the complexity of organic beings. The panel agreed with earlier panels that what were are witnessing is bigger than the industrial revolution. The knowledge explosion, as many called it, was going to fundamentally change how we do everything in the future. Overall, it was an amazing experience. Among all the speakers and panelists, there were several messages that came across. The mood of everyone thinking about the future was one of optimism and opportunity. The interconnecting of everyone person on earth will trigger a knowledge revolution that will have deep, drastic changes on our lives and those around us. But if these future developments are met with some skepticism, and intelligence, it will undoubtedly be a good thing. September 9th update: Want to see the event yourself? The entire thing is available online in RealVideo and RealAudio.